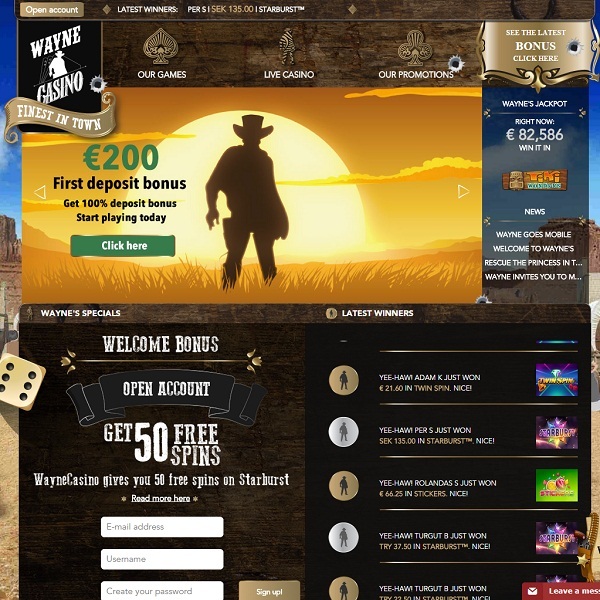 If you enjoy old western films and part of you has always wanted to dress up as a cowboy or cowgirl then take a look at the brand new Wild West themed Wayne Casino. The casino offers games from Net Entertainment and NYX Interactive. This means that members can enjoy more than 120 different titles. There is a huge range on offer including video slots, classic slots, card and table games, video poker, scratch cards, arcade games and more. Furthermore, there is a live casino which offers an excellent range of titles. New members of Wayne Casino will receive a 100% first deposit bonus of up to €200 and 50 free spins on Starburst slot. There are then 30% weekly deposit bonuses available, 50% monthly deposit bonuses and a number of other generous ongoing promotions.